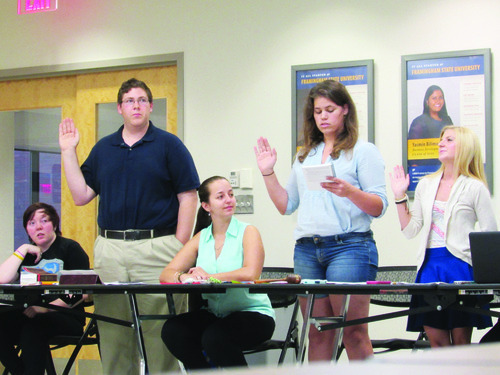 Student Government Association [SGA] nominations for the fall 2014 elections will open on Sept. 16 at 9:00 a.m. and close on Sept. 21 at noon, said SGA President Kendall Valente. According to Valente, forms will be available in the SGA office (room 404 in the McCarthy center) and will be given to anyone who stops by the office. “An eBoard member should be there to help with that. If they’re not, then we will leave instructions,” said Valente. Multiple restrictions apply to potential nominees and the application forms. There is a maximum of one form per person and forms are to be used for self-nominations only. “Any nomination forms that are brought to SGA must be given to an eBoard member. They are not to be given to a senator [at large],” said Valente. A senator-at-large is “a senate position not related to your class,” she said. She explained nomination procedures for the benefit of those unfamiliar with the process. The nomination form needs to be signed by a certain number of students. “I believe it’s 10,” said Valente. In order to be nominated as a class officer or senator, the signatures must be from other students in that class (i.e., to be nominated as a 2018 class officer, signatures are valid only if the signee belongs to the class of 2018). This restriction does not apply to those who seek a senator-at-large position – signatures are valid as long as the signee is a current FSU student. According to Valente, there are 20 senator-at-large seats, four class officer seats and six class senator seats open for nomination. Nomination forms are due by Sept. 23, which coincides with Candidates’ Night. This event will occur at 5:30 p.m. in DPAC [Dwight Performing Arts Center]. Candidates are encouraged to attend this event to meet other candidates and have the option of giving a nomination speech. Elections will be held on Sept. 30 from 9:00 a.m. – 5:00 p.m. According to Valente, computers will be available in the McCarthy Center to cast votes. “You can also go online on CollegiateLink,” she added. • Taylor Loesche was appointed Senate Chair and Nathan Stowes was appointed Parliamentarian for the 2014-15 academic year. • Allison Chisholm, academic success coordinator for the Center for Academic Success and Advising [CASA] and Claire Ostrander, associate director of Student Involvement and Leadership Development [SILD], were sworn in as SGA’s faculty advisors for the 2014-15 academic year. • Homecoming and family weekend will be Sept. 26 and 27. • Student Transportation has transitioned out of SILD and is now coordinated out of Facilities & Capital Planning. According to Ostrander, there will be some “bumps in the road” during this transitional period. • The new Transportation Services Coordinator is April Facchini, who has an office in Crocker Hall Annex. • The Taxi Voucher program has added Wal-Mart to its current list of locations. Vouchers can be purchased in the game room in the McCarthy Center.